A 1-0 win for the Sounders at Sporting Park was the first of two important wins for them in this round (the second being a 4-0 home win against the San Jose Earthquakes). Djimi Traoré scored in the 94th minute to steal the three points for the visiting Sounders in a heated game that featured back-up goalkeeper Marcus Hahnemann being ejected from the Seattle bench. Traoré’s goal came after Aurélien Collin whiffed his clearance on a long throw-in, thus allowing Traoré to smash in the game-winner from close range. For the Sounders, three road points against a very good SKC team are big, and those points, coupled with the rout against the Quakes at the weekend, indicate that the team may be back on a winning path. A brace from Russell Teibert spurred the ‘Caps to get out of their winless funk with a 3-1 home win over the Galaxy. The game remained scoreless until the 63rd minute, when Teibert fired a left-footed strike into the bottom left corner. The goal was Teibert’s first in MLS, and he got himself another in the 76th minute, burying a set-up from Gershon Koffie. Gyasi Zardes scored his first MLS goal ten minutes later for LA, heading in a cross from Jose Villarreal, but a goal from Darren Mattocks in stoppage time sealed the win for the home side. For Vancouver, these were three big points over a conference rival to grab them their first win in seven games. Sporting Kansas City broke the Dynamo’s 36-game home unbeaten streak on Sunday thanks to a goal from Aurélien Collin. Collin headed a long throw-in from Seth Sinovic past keeper Tally Hall in the 73rd minute, and despite Houston’s best efforts to equalize, the lone goal was enough to end the Dynamo’s record run. The game’s last fifteen minutes saw a slew of efforts from Houston to get a goal, but this time, it wasn’t meant to be. 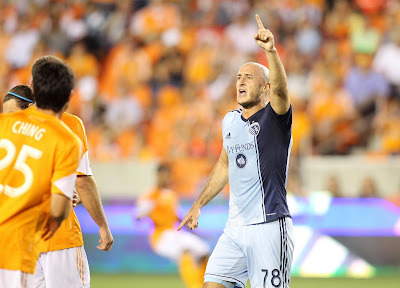 SKC and the Dynamo now sit second and third in the Eastern Conference with 20 points each, and don’t be surprised if we see this match-up again later in the season during playoffs (though we’ll also see it again in two weeks). 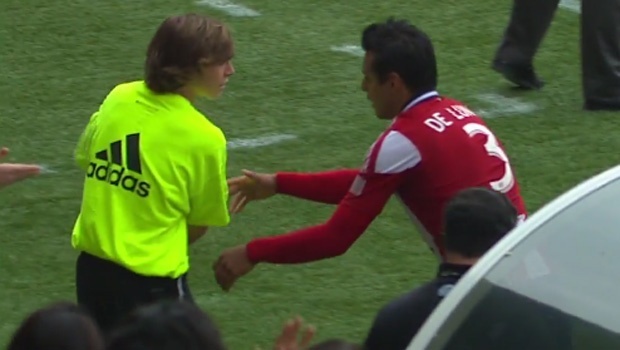 During the Portland Timbers’ 3-0 win over Chivas USA, Chivas defender Mario de Luna pushed a ball kid who refused to give him the ball after the referee signaled for a Timbers throw-in. De Luna received a yellow card for his trouble and could likely face additional punishment from the MLS Disciplinary Committee. Chivas USA have acquired Gabriel Farfan from the Philadelphia Union in exchange for a 2014 SuperDraft first-round pick and allocation money. Chivas currently sit in last place in the Western Conference. LISTEN: Luke Lohr and Pedro Gomes debate the ball kid, the results and more. The Philadelphia Union host the LA Galaxy on Wednesday night, then the weekend starts off with the Columbus Crew visiting Toronto. The Timbers travel to Vancouver, the Fire to Philadelphia, and the Revs head to Houston. Meanwhile, Seattle welcome Dallas as the Quakes and the Rapids face off in San Jose. On Sunday, New York host the Galaxy, while SKC visit DC, and finally RSL visit Chivas. Will Bruin. The forward continued his penchant for dismantling DC United in the Dynamo’s 4-0 win. Bruin scored two and assisted his team’s two other goals of the game.